BALTIMORE — A largely peaceful protest over the death of Freddie Gray, a 25-year-old black man who suffered a spinal cord injury in police custody, gave way to scattered scenes of chaos here on Saturday night, as demonstrators smashed a downtown storefront window, threw rocks and bottles and damaged police cruisers, while officers in riot gear broke up skirmishes and made 12 arrests near Camden Yards. 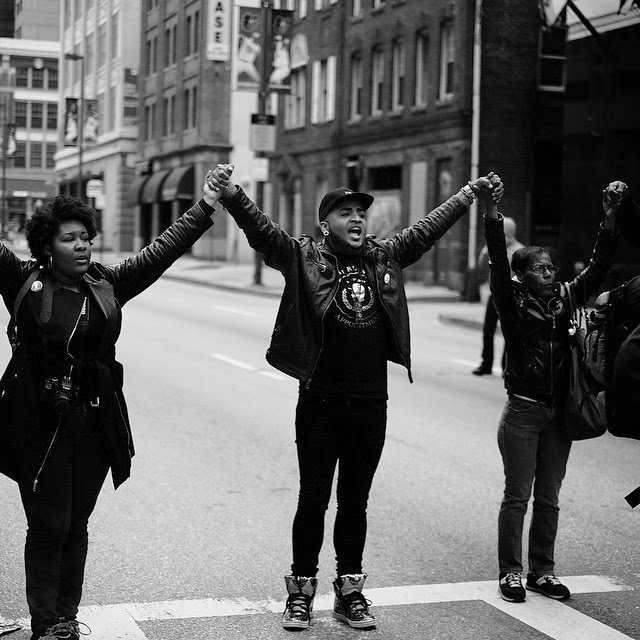 Tensions have been high since the murder of Mike Brown in Ferguson Missouri , and the Black Lives Matters movement has been picking up momentum ever since, with protest all in solidarity all over the world. The protest in Baltimore, Maryland this past weekend is a continuation of this ongoing battle with the justice system. A photographer whom I haven't heard of previously and whose identify is still unknown to me presently, pieces of work kept popping up on all my social networks. He has in a phenomenal way used his art to create a beautiful narrative of the Baltimore protest in the name of Freddie Gray. A testament to making sure we navigate this story of present events; that will crucial period United States history.